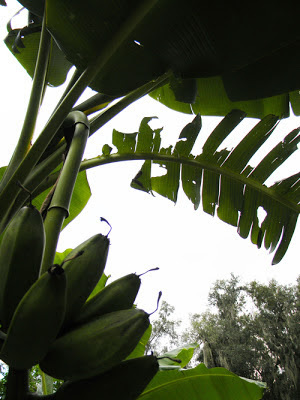 Growing banana trees in North Florida is more than possible. 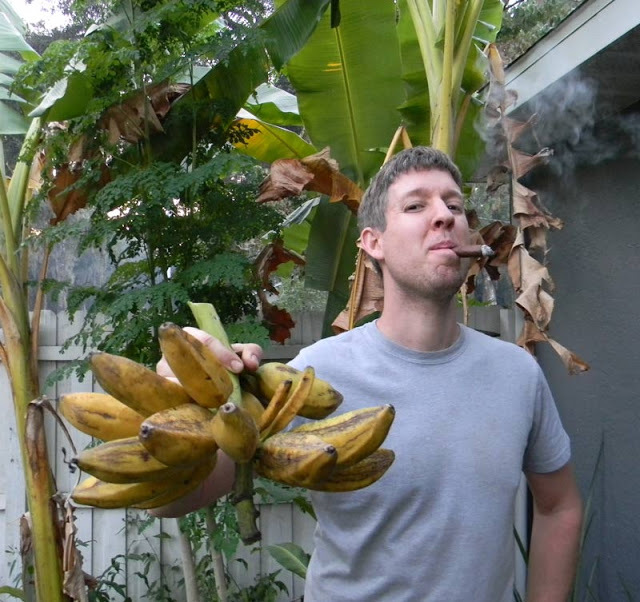 In South Florida, bananas will produce year-round. Since they’re non-seasonal, your goal should be to plant a big patch of them so you’re getting new fruit for cooking and fresh eating on a regular basis. In the northern half of the state, frosts and cold will take a big chunk out of your yields. That’s not to say it isn’t worth planting bananas there – it’s just going to be less reliable than some other plants. Like collards or even a weed like Spanish needle. Of course – bananas taste better than both of those, so heck with it. We’re gonna grow them anyway – because that’s what we mad horticulturalists do. Bananas, even though subject to frost damage, are still beautiful trees and worth growing. One of the most beautiful plants. Grow it! Now we can only propagate most banana plants by dividing off the pups. That’s not good for genetic diversity, but it is good for getting consistent results. I know. You’ve seen this before. This, incidentally, is the south wall of my house. ZONE 10! Let’s assume you’ve got a little baby banana plant that someone really nice gave you. When you plant that in your yard, it will start to grow into a big banana plant. Quickly if you water and feed it… slowly if you don’t. Beneath the ground, a bulb is growing. As the first “tree” gets bigger and bigger, little pups will generally start growing alongside it. Leave at least one there – you’re gonna need it. When your original banana has successfully created a certain number of leaves, it will then flower and create a lovely stalk of bananas. Watching the bud unfurl and young bananas peek out is like magic. The first rows are all female, meaning they’ll be your fruit… and then after those have all appeared, the bud will continue to descend and reveal male flowers. The bananas take a long time to ripen, in my experience. At least four months or more. This is bad if the tree decides to bloom in the fall… and you get frost in your area. I have one in my side yard doing that right now. It being December, those poor bananas are going to freeze right off unless I can find a way to protect them. When the fruit turn yellow – or start to – you can cut the entire cluster off the tree and bring it inside to ripen completely. Plantains are a higher-starch variety of banana that are used for cooking – I usually wait until those are mostly black before cooking them. If you’d rather them not be sweet, you can cut and cook them earlier. Unfortunately, plantains do NOT like the cold (though I’m attempting to grow them here anyhow). If you’re up north, I’d recommend begging pups off friends, neighbors or strangers in your local area… that way you know the plants are likely to survive some freezes. Once you harvest your bananas, that “tree” is done. Kaput. Played out. Yesterday’s news. Old hat. Dead and gone. Expired. It’s not going to make more bananas for you. So cut that stem down WITH A MACHETE! Or it will die on its own. Then the next largest pup beside it (you did leave a pup, right?) will take its place. Remember – the “tree” is basically a big bulbous plant with multiple tops above ground – not a real tree at all. Storability: When pulled green, they keep for a week or two. May be dried or frozen. you have amazing success on your south wall! its inspiring. Thanks. Sounds like I won't have any trouble feeding rabbits when I get them. Discovering microclimates has been exciting. Yesterday, I picked three ripe papaya… and it's December! We've already had two frosts. Of course, a worse one is coming tonight, so we'll see what happens. That's strange – mine haven't done that, potentially because they freeze off if they hang too late. Usually papaya take a long time to ripen – probably 6-7 months here. I'm sure it's not that long down south. The problem here is that when they get to ripening size, the cold comes in and the tree quits going. If they're big and green and they're just not doing it, try picking one and letting it sit on your counter for a week or two. They'll often ripen that way. Our papaya fruit sat on the tree through the winter and ripened up the next May/June and were yummy. Just wait it out. Zone 9a/9b central Florida. I want to hear more about what rabbits can eat. Thanks for the post. Pablo? What are you talking about? Stop licking your brushes! We live in Southwest Florida. We have a magnificent Mango tree but the last 3 years the squirrels have gotten every one of the mangos. I tried a tobasco rub but I couldn't keep up. I'm thinking about large plastic snakes. Any great suggestions? Squirrels are the bane of peach and mango tree owners. You need more predators. Snakes, hawks, owls. I'd build stick and rock piles and maybe plant more random stuff around the base of the tree to make the squirrels nervous. If your yard is fenced in get a Jackrussell Terrier. No Squirrel will want To Explore your yard when your new “little Freind” is introduced! ! Good suggestion. I have a friend with a pair of them. Great dogs. Yes. I actually have a really good variety for sale right now: the Raja Puri banana. Fast, highly productive dessert type with good cold hardiness. Pups are $6.00 each. They're about 14-18" tall at the moment. Great… how do I order them? E-mail me off the "Contact David" link on the sidebar. How do I keep the squirrels away from my bananas as they ripen . I see their little teeth marks in them then pick the whole pup in . I finish ripening them & make all kinds of floats, puddings , cakes & dried slices . Is there a way of covering them with some type of strong closely knit screeing or a basket to keep the squirrels & raccoons away .? here are a couple tips i have found useful. a) bananas which have "filled out" will ripen indoors if cut, taken in, and hung before frost. b) if you are worried there is not enough time for yours to fill out, prune the harvest. as your nanners bloom, let them have five or six hands, then carefully cut off the rest as they appear, usually one hand per day. 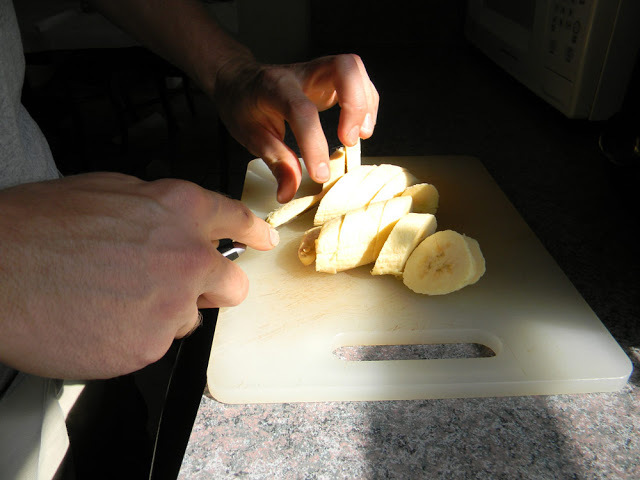 your nanner plant will then put all its resources into "filling out" those hands, rather than trying to mature ten or twenty hands. five hands of bananas that ripen is better than ten that don't. want more? plant more. c) unripe nanners are good cooked! i like to fry them and (optional) sprinkle with sugar. I recently purchased 1 dwarf cavendish banana pup and 3 dwarf puerto rican plantain pups. I want to plant them together since I read they like to be grown in groups. Is the banana fruit going to be negatively affected by the plantain, or vice versa? I'm in Florida… Zone 10a, and I have never grown bananas or plantains before! Hi Wendy – thank you. They should do well together; just make sure they aren't so close that the more vigorous varieties shade the lesser. Also, make sure they get lots of water, lots of nitrogen and lots of mulch. You'll probably be picking bananas next year. Good luck! You're welcome! Glad to hear these plants can play nice together. Do you have a hunch as to which would be more vigorous? My limited research has their ultimate heights in the 8-11ft range. Proooobably the plantain… but I can't say for sure. Plant them and see! Okie dokie. Thanks for your input! We recently moved to SE FLA and I am a newbee gardener. I have purchased several fruit trees & bushes and was fortunate to find that we have a magnificent bunch of banana trees. 2 of then were ripe and ready upon our arrival and tasted so yummy. I thought Holy smokes how on earth re we going to consume this many bannans (not knowing that the next Mother load was going to take sooooooo long:)….that being said one is about ready so I took the advice of a friend and cut it down to hang in my garage. He then said cut it down or better yet take it out. He said it will just take water from the rest. That was the first I heard of that. Is it OK to take it out? or should it just be cut down as you mentioned previously? Yes. Cut the tree that bore the stalk of bananas to the ground and the next biggest “pup” in the group will rise to take its place. Each “tree” only bears once.